The Better Buildings Challenge is an exciting program that encourages building owners of commercial and industrial buildings to cut down on energy and water usage. It’s done by assessing buildings and identifying individual ways to improve them. By 2020, the buildings participating in the challenge strive to cut down on energy by up to 20%. 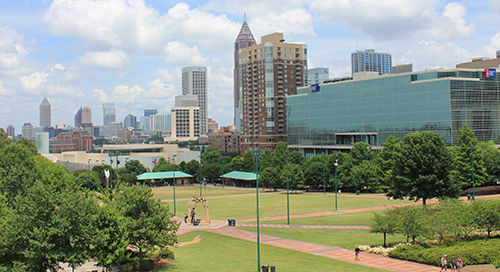 Atlanta’s ultimate goal is to become a top-tier city for sustainability, and the city is well on its way. 70 buildings have already joined the Better Buildings challenge, 23 of which have received full assessments with terrific energy saving measures. Some buildings working with Sustainable Investment Group (SIG) on the challenge are the GA Dome, the GA World Congress Center and the Federal Reserve Bank of Atlanta, among others. A projection for the Georgia Tech Research Institute (200,459 sq ft) estimates that if water use is reduced by 20%, 31 Bath Tubs can be filled each year. 20% energy reduction can power up to 644 homes, and a potential $100,000 could be saved annually! A complete list of participating buildings and their progress can be found here. Industry professionals and building owners can help others get involved by simply spreading the word about the challenge. Tenants may look into getting their buildings involved. Cutting down on energy usage in a building ultimately increases occupant satisfaction, lowers operating costs and cuts down on greenhouse gas emission. Aaron Bastian, the Communications and Project Manager, from the Mayor’s Office of Sustainability gave a talk on sustainability initiatives at The High Performance Building Summit in Atlanta on Thursday, March 20, 2014. You can learn more information about that event here. Some of the projects in progress are the installation of more energy efficient indoor and outdoor lighting, the enforcement of mandatory recycling for big city events, water conservation efforts, and the reduction of paper use. A full list of sustainability initiatives and the details of their execution is on the Atlanta government website. In addition to the BBC, Energy Star’s Battle of the Buildings is a nationwide competition for teams of five or more buildings to see who can save the most energy. Some current teams, like Sustainable Investment Group’s client, Paramount Group, have several buildings from different parts of the country entered, and have covered nearly eight million square feet of property. For more information on the Battle of the Buildings or Paramount Group, you can visit the previous Sustainable Investment Group SIG blog, here or the ENERGY STAR website. So find out how you can get in on the challenge to help save energy, optimize building usage, and sustain the planet today!